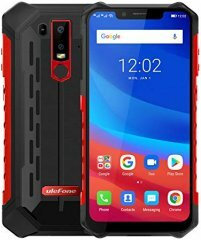 The Armor 6 is one of the highest-specked rugged smartphones in Ulefone's 2018 catalog -- it hit the market on December of 2018, but it's pitched by the brand as one of its top indestructible phones for 2019. Nevertheless, our thorough review of its pros and cons says that this Armor edition is not exactly an unblemished toughened phone. For starters, despite lining up with many high-caliber rugged phones on multiple fronts, this 267.5g-heavy Ulefone model runs on MediaTek's middle-class Helio P60 eight-core processor clocked at only 2GHz , whereas the engines used by some of its closest rivals run at 2.5GHz. It comes with a large 6GB RAM , though, which was one of the highest RAM counts in the rugged smartphone category as we were checking out its specs. 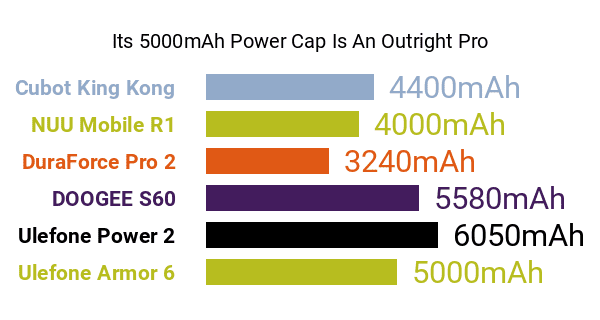 Heading over to its pros, the Armor 6 feeds off a robust 5000mAh battery that powers up either through its wired 9V/2A quick-charging system or through a Qi-standard wireless charging dock -- don't forget to check out some of the best big-battery smartphones featured here on Phonerated. Additionally, it likely holds its ground versus most other rugged phones on the market, rocking a reinforced housing that passes IP68/IP69K and MIL-STD-810G rugged certifications . This means that its body is impervious to dust and liquids, while being resistant to accidental drops and temperature extremes, among others. p> It touts a 6.2-inch 2246 x 1080 display that's furbished with Corning's scratch-resistant Gorilla Glass 5 panel and on whose notch sits an 8-megapixel f/1.8-aperture front camera interpolated to 13 megapixels. 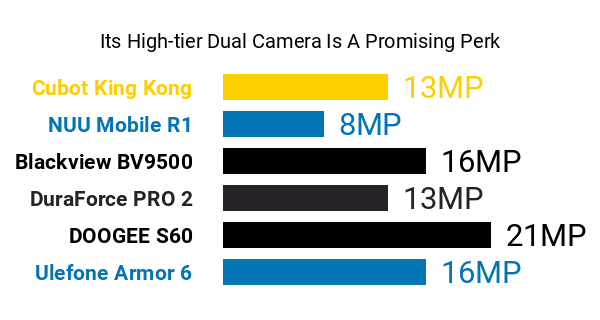 At the back, it sports a dual-lens system consisting of a 16-megapixel primary lens and an 8-megapixel depth-of-field lens, both of which are also interpolated (enhanced using software) to 21 and 13 megapixels accordingly. Fittingly accompanying its dual rear camera is a dual LED flash. The Armor 6's pros and cons also include a respectable 128GB internal memory that can be expanded by up to 256GB , a UV light detector , and a circular rear-mounted fingerprint reader. Also, it comes with a Face Unlock feature for added security. All said, the heavily-armored Ulefone Armor 6 makes for a solid choice for outdoor thrill-seekers or field workers in various industries.